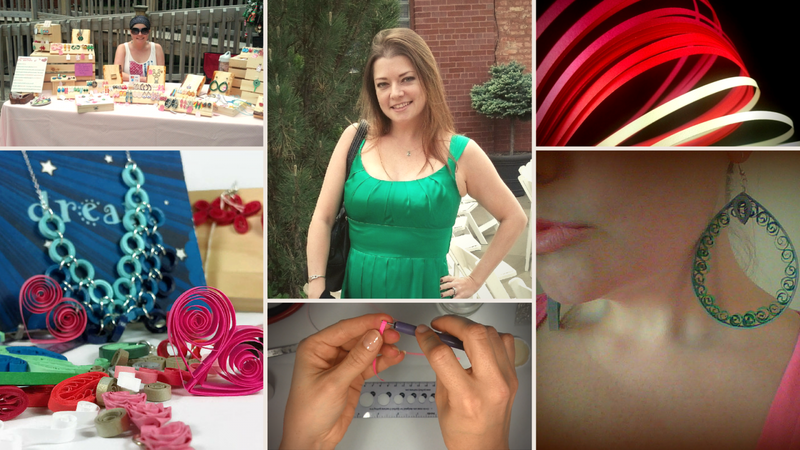 I love paper quilling and making paper quilled jewelry, ornaments, and art pieces. I also make gel medium art pieces whereby I transfer ink from carefully spliced pieces of paper to canvas, often including paint and other mixed media. I then embellish the images with paper filigree, making 3D paper quilled art. Outside of my shop I often take quilling beyond "the norm" and love experimenting to see what I can make, including baby mobiles, holiday centerpieces, hair accessories, greeting cards, sculptures, and wedding cake toppers...all from humble strips of paper. I grew up thinking that the art gene skipped over me. My brother and sister could draw and paint in a way I could never figure out. When I drew a person the proportions were always wrong and my self-portrait looked more like "The Scream" than my own face. In college I quit my drawing class after one day because my professor had used my canvas as an example of "what not to do". I remember crying on the walk back to my dorm room. It was one of the few times I ever quit anything. Thank goodness, I didn't let a bad experience stop me. Eventually, with the encouragement of a few people in my life, I realized that I didn't have to be artsy...I could be crafty. My Aunty Cathy introduced me to quilling. She, however, is an amazing quilter; quilTer, with a T. She does things with fabric that would make Belgian nuns jealous and she always creates her pieces with love of family as her muse. Thanks to her encouragement and faith in my creativity, I found my talent as a crafter. She always knew the art gene didn't skip over me, it just needed to be harnessed in a different way.